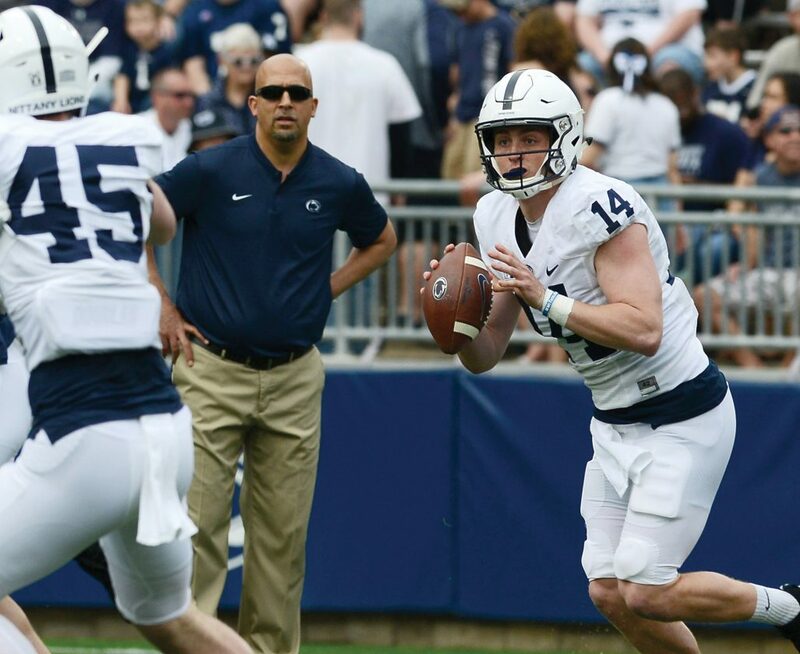 04/13/19 Patrick Waksmunski / Blue-White / Penn State head coach James Franklin watches quarterback Sean Clifford look downfield. UNIVERSITY PARK — True freshman tailback Noah Cain showed he’s able to do some special things running the ball, and quarterback Sean Clifford did, as well, during the Blue-White Game. Penn State’s spring game drew an estimated 61,000 fans to Beaver Stadium on a gorgeous Saturday afternoon, and while most probably didn’t know much about Cain prior to the scrimmage, they certainly did afterward. Cain showed a hard-nosed running style and scored a touchdown for each side as the Blue team (starters) defeated the White, 24-7. Cain won’t be the starting running back this fall — that’s a battle between Ricky Slade and Journey Brown — but the freshman certainly showed he could have a bright future. “We knew Noah was going to be a very good player for us, and we’re excited about his spring,” offensive coordinator Ricky Rahne said. Cain finished with 41 yards rushing and one TD on eight carries for the White team against the first-team defense. He also carried four times for 4 yards for the Blue team. Cain had a tough run on his 2-yard TD against the Blue in the second quarter. Then in the game’s closing minutes, he caught a screen pass from Clifford and bulldozed his way for an 8-yard score. Slade had a 1-yard TD run for the Blue, and the best highlight of the day came when Will Levis threw a 59-yard TD pass to wideout Dan Chisena in the third quarter. Coach James Franklin announced seconds later that Chisena, a walk-on, was being put on scholarship. Projected starting quarterback Tommy Stevens warmed up but, as expected, did not play in the scrimmage. He’s been limited this spring after surgery in December. That meant Clifford got most of the reps with the Blue team, and he turned in a solid day. He finished 11-of-19 (two passes were dropped) for 118 yards and one TD. Clifford answered some questions about his mobility as he carried six times for 31 yards, second-highest total on the day to Cain’s 45 yards. Stevens is known more as the running threat and Clifford as the prototypical pocket passer, but Clifford moved well in the pocket and tucked the ball and ran for a first down on a couple of occasions. “Clifford’s probably a better athlete than people think he is, so he’s able to get out of the pocket and make some plays with his feet,” Rahne said. Not every time Clifford ran the ball was ideal, however. Franklin was asked after the game if he’s ready to name Stevens as the starting quarterback, which most expect to be the case to open the season in 4 ¢ months. But while it’s true Stevens, a senior, and Clifford, a sophomore, are competing for the job, one would have to think Franklin and the coaches know what the decision ultimately will be. Stevens’ father, Tom, made some interesting comments this week indicating what would happen if his son is not named PSU’s starter. “Tommy has so much invested in this year, and we know that this is his last shot,” Tom Stevens told the CDT. 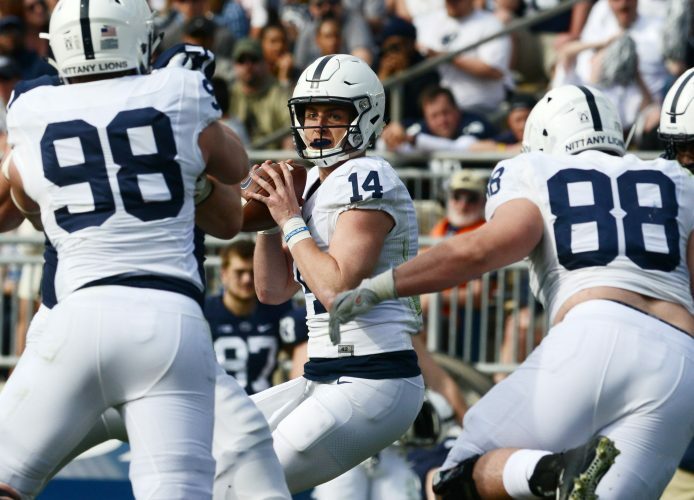 “If he’s not Penn State’s quarterback, he’s going to be somebody’s quarterback. There’s no question, though, that getting so many first-team reps this spring has helped Clifford build a good rapport with the receivers. In terms of such chemistry, Stevens has been the primary backup for most of the past three years, but he wasn’t able to build as much chemistry with the young receivers last season because he was injured some and Clifford was No. 2 behind Trace McSorley. “I think competition is important across the board at every position because that means you’re healthy at that position,” Rahne said.